Yes, yes, my God, you’ve seen a regulation pantload of Deschutes reviews here. They were the first brewery to send me review samples, arguably the most consistent producer in the country, and – not coincidentally – my favorite NW brewery since 1992, seventeen years before The Pour Fool was born. And I hope to review Deschutes until I keel over into the potato salad (these days, quinoa salad) and slip these mortal coils. …which leads me to a shocking admission. There actually was ONE Deschutes ale that I just flat didn’t like. 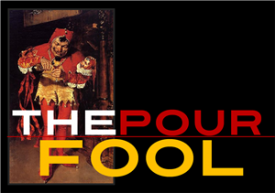 I didn’t write about it here because The Pour Fool is not about trashing beers, wines, spirits, or the makers thereof…okay, except for Budweiser and AB/InBev. But I would no more savage a craft beer than attempt a blindfolded auto-circumcision. So, I sent a note to their PR firm and politely (I think, I hope) declined to review the beer. That was about…three years ago. The beer was called “MisSpelt Hefeweizen” and it wasn’t even that I just didn’t like it at all, aside from some overly-energetic spiciness. I just thought it wasn’t really a Hefeweizen and that the flavors were wrong for that style. Yeah, I know: monumental chutzpah, right? Who am I, your lowly Fool, to tell the likes of Larry Sidor (at the time) and the Deschutes Marketing team about beer styles? Given my level of experience, though, I couldn’t write about it. Not if I’m trying to be honest, which, let’s face it, is about all this bloglet has going for it. So, when I saw a spelt beer in this box, I recoiled like they had sent a live scorpion…at first. Curiosity overcame any reservations that were lingering, and I cowboyed up, popped the cap smartly, and spilled some into the munchie cave. And, BOY, am I glad I did. Spelt, as I should have remembered from my misspent career as a chef, is actually a grand, robust, earthy, chewy, mellow grain; like barley on steriods. It’s almost brazenly flavorful, as I remember quite well from my various uses of it in bread baking and hot cereals. And it’s that earthiness, that wonderful, palate-coating toastiness, that shows up so strongly in the new Deschutes/Distelhäuser collaboration, Doppel Dinkel Bock. 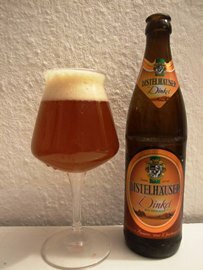 Distelhäuser, for those not up to speed on German breweries, is a very modern, forward-thinking company that stands out even more starkly than their considerable skill would warrant, mostly because they’re such a breath of fresh air in a beer culture that can be a tad stuffy. 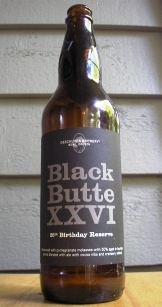 They are, in many ways, the German Deschutes. When I saw the names linked for the first time, about four months ago, I thought, “Well, that makes perfect sense!” And now, the pair has created, for its type, a very nearly perfect lager. 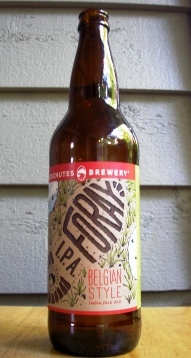 Just as fine but completely different was Deschutes “Foray” Belgian-Style IPA. Belgian IPAs are all the fashion, right now, and a lot breweries that would’t have thought to make one even three years ago are having a whack at it…with predictably mixed results. This is NOT, it must be noted, to be confused with Deschutes “Chainbreaker” White IPA, which is a hybrid witbier/IPA. Foray doesn’t use wheat exclusively and the “Belgian” part of the equation is driven mostly by the assertive Belgian yeast(s) used in the fermentation. 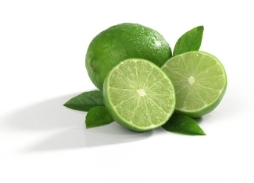 This yeast-driven flavor profile develops voluptuous notes of tropical and citrus fruits, baking spices, bananas, bubble gum, mint, and hints of melon. To that, we add a bold cocktail of Nugget, Amarillo, Mosiac, CTZ, and Galaxy hops and…a little alchemy happens. #26 is a feast; a tar-black, dense, impossibly creamy, fiercely complex concoction that offers up classic dark ale flavors of molasses cookies, cafe au lait, bitter chocolate, figs, and dark caramels as just a starting point, after which grace notes by the dozens surface and flit by: mixed citrus, cherries, sultanas, sage, anise, licorice, burnt sugar, whole-grain toast, roasted nuts, pine and spruce resins, sweet herbs, gorgeous barrel flavors, and Brandied dates, just to name a few. Another Pour Fool post, another slobbering paen to Deschutes. It bothers me greatly that I read these Penthouse forum posts over and over and then search hi and lo for the stupid Deschutes bottles here in the bottle shop desert that is Socal. And over and over I am completely silenced by the utter consistency and remarkable intent of their beers. Everything they do feels like it has a purpose (with the exception of River Ale which escapes me entirely). It is a good time to be a beer drinker in America if you are willing to exert even the slightest effort. River Ale escapes me, too. In fact, it.s one of only two Deschutes beers I declined to review but then found a place for it as part of a gateway progression for getting mega-brew addicts into craft beer. Yeah, I slobber. But they send samples and, if I am going to be honest about it (which is 90% of all this blog has going for it), that’s what I have to write. Stone sends samples, now, and I’m pretty much in the same boat. If AleSmith and Allagash start mailing me stuff, I’m pretty well screwed. ← Tin Dog Brewing and Big Block Brewing: Let’s Get Small!